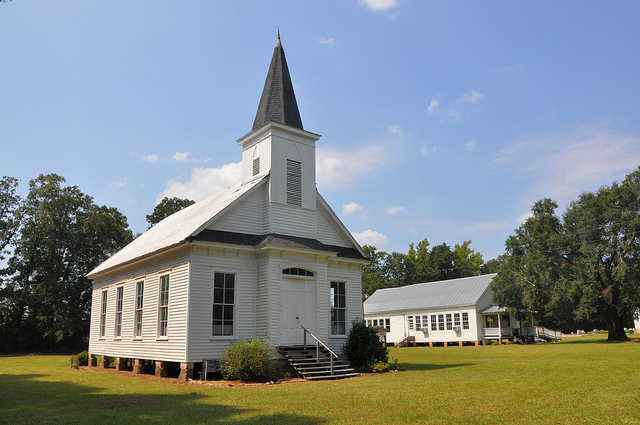 As you’ll see in the following posts, Louvale’s Church Row (a National Register Historic Site) is one of the most historic and unique religious landmarks in Georgia. 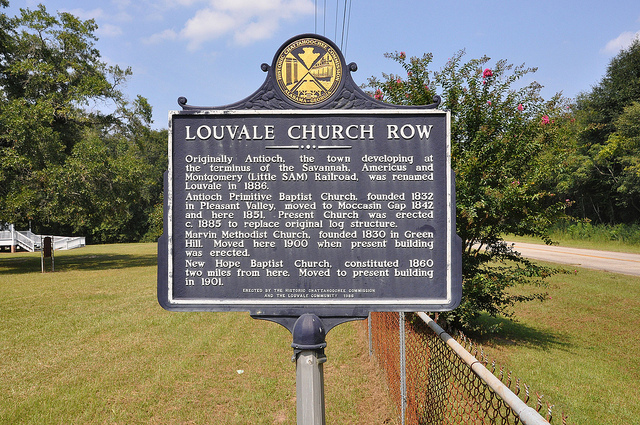 The marker placed by the Chattahoochee Historical Commission and the people of Louvale in 1986 reads: Originally Antioch, the town developing at the terminus of the Savannah, Americus and Montgomery (Little SAM) Railroad, was renamed Louvale in 1886. Antioch Primitive Baptist Church, founded 1832 in Pleasant Valley, moved to Moccasin Gap 1842 and here 1851. Present church was erected c. 1885 to replace original log structure. 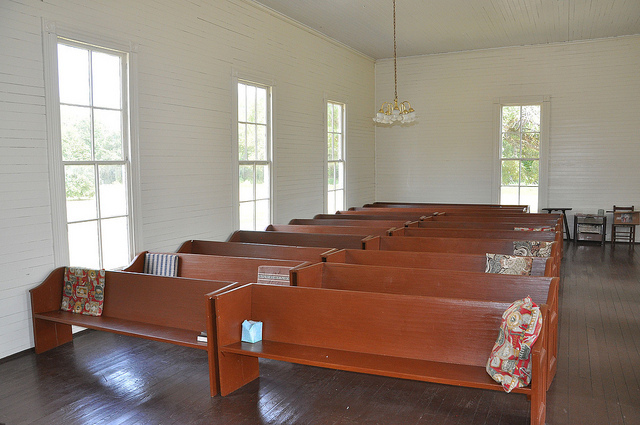 Marvin Methodist Church, founded 1830 in Green Hill moved here 1900 when present building was erected. New Hope Baptist Church constituted 1860 two miles from here moved to present building in 1901. 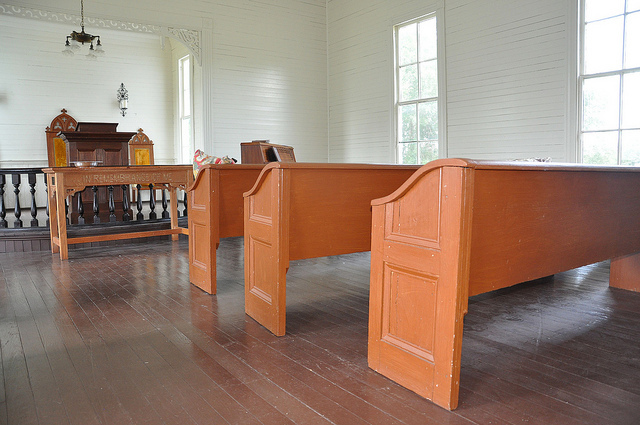 Antioch Primitive Baptist began in 1832 in Spring Valley, moved to Moccasin Gap in 1842 and finally settled here in 1851. A log cabin was used for services, as well as the Institute next door, until this structure was built in 1885. At first glance it’s not as imposing as the other three structures on Louvale’s wonderful Church Row, but the Antioch Institute is the most historic of the lot. 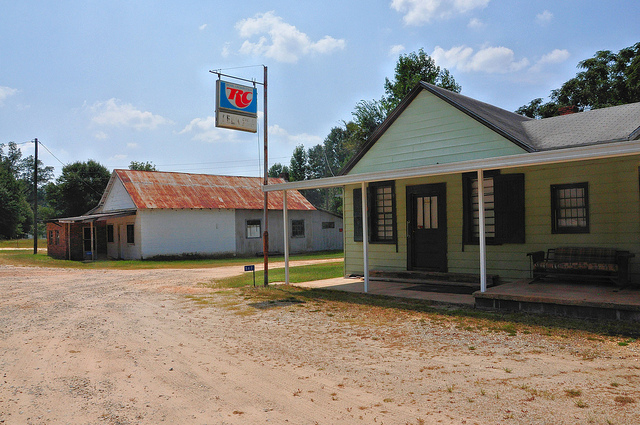 Antebellum school buildings are rare in South Georgia. 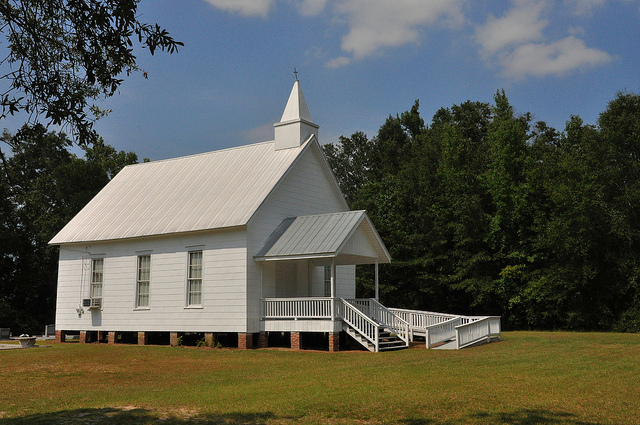 It was built in the 1850s and operated by the Antioch Primitive Baptist Church until 1895. 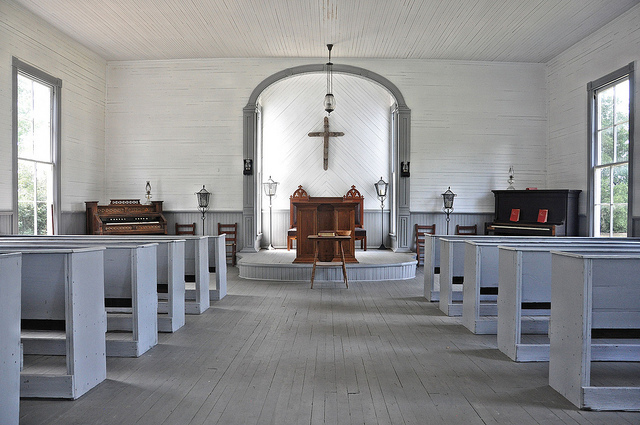 It is believed to have also been used as the church until the structure to the south was built in 1885. Today it serves as the Louvale Community House and is the home of the Sybil and John B. Richardson School of Sacred Harp Singing. The historic marker, placed by the Historic Chattahoochee Commission and Antioch Primitive Baptist Church in 1986 reads: Built in the 1850s, the school was operated by the Antioch Primitive Baptist Church until it was sold to Stewart County in 1895. The building is believed to have been used for church services until the handsome building to the south was erected for that purpose about 1885. The county operated the Louvale High School here until 1928 when the upper grades were transferred to Lumpkin. The elementary school remained until 1942. 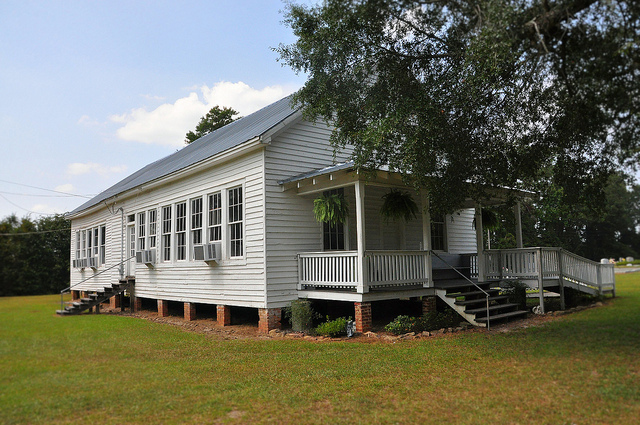 The school is now used as the Louvale Community House which serves as the home for the Sybil and John B. Richardson School of Sacred Harp Singing. 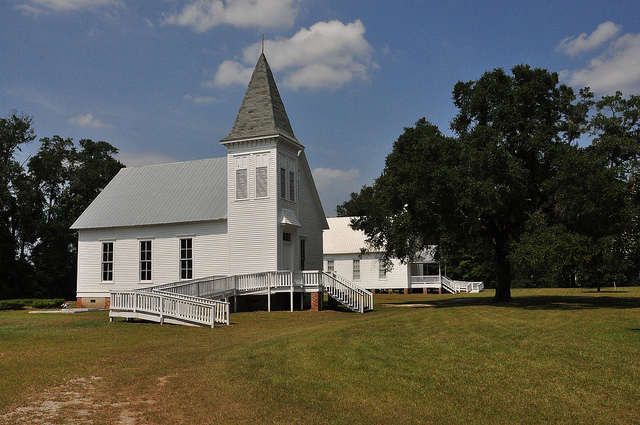 Founded in Green Hill in 1830, Marvin Methodist moved to Louvale in 1900 when the present structure was built. Like New Hope Baptist next door, Marvin Methodist has pillows on the pews. 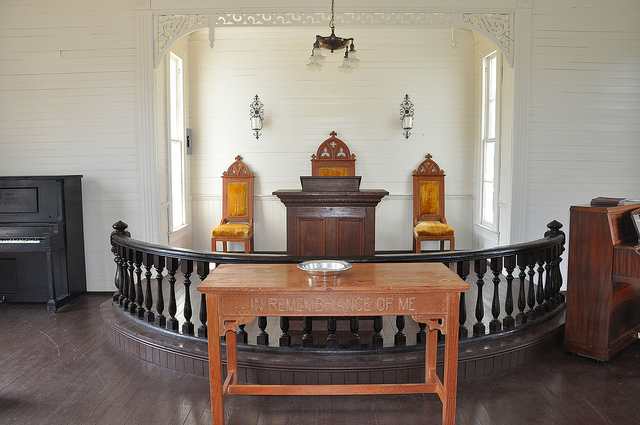 The pulpit features a beautiful curved altar. 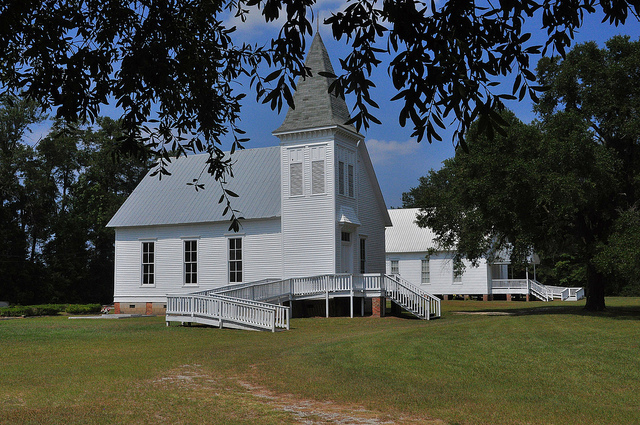 Constituted in 1860, two miles from this location, New Hope built the present church in 1901. 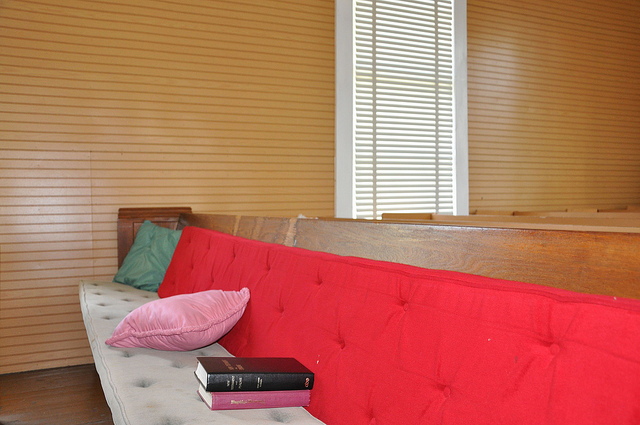 It’s still an active congregation today and members keep it comfortable with cushions and pillows on the old pews. 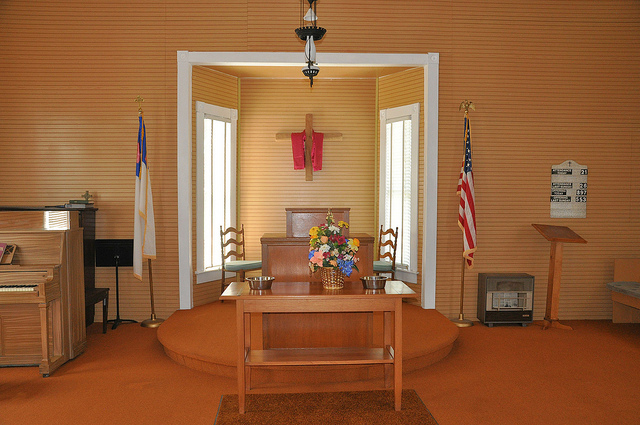 The church is very well-maintained; I really liked the yellow walls. 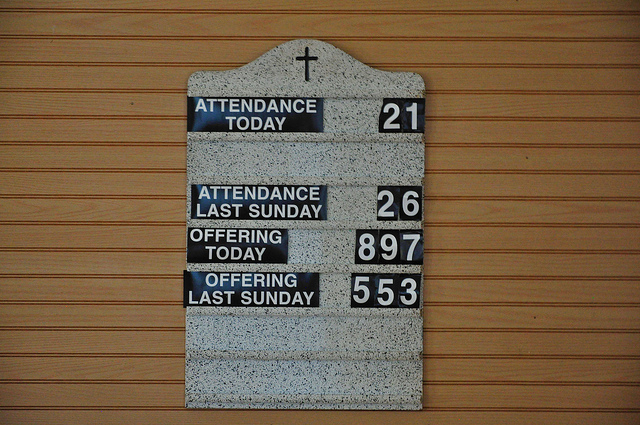 Though it’s a small congregation, it’s very aware of its history and importance in the area. The green building on the right is the old Peek Grocery. Louvale is a neat place, most famous for its church row just up the road. 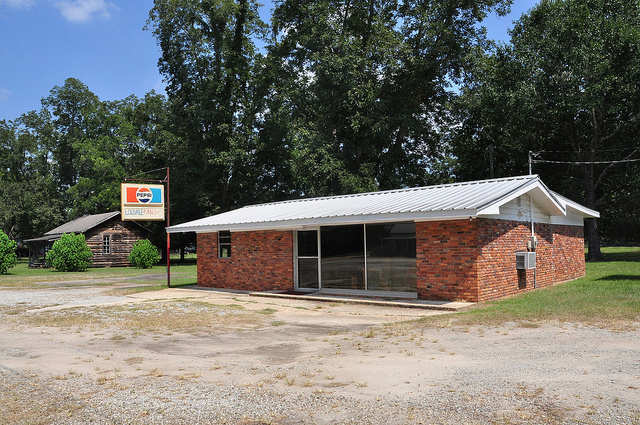 Mike writes: The store with the Pepsi Cola sign was known as Pates Grocery. It was a place where deer hunters gathered back in the 80’s when hunting deer with dogs was very active . The lady that ran it was known as Ma Pate . Her mother told me one time that all around there were the most beautiful Cotton fields and then one day some(one) came along bought it all up and planted it in pine trees . That later led to the most attractive hunting area in the state. I hunted there for 25 years 1977-2003 in a club that was named Hitchitee Creek Hunting Club (leased from Ga. Kraft then sold to Mead which later merged with Westvaco.